On March 24, 2001, during a spring training game between the Arizona Diamondbacks and the San Francisco Giants, Randy Johnson, now a Hall of Famer, stood on the mound facing Giant’s Calvin Murray . Johnson threw a fastball that wouldn’t make it to the plate. Instead, the ball came into direct contact with a bird flying across the path of the incoming ball. It all happened so fast that if it weren’t for the announcer saying something into the mic during the broadcast, most people would have missed it. When asked about it later, Johnson indicated that he saw a going across home plate. He then said that he spotted that this fastball hit the blur. At the time, he wasn’t aware that the object in motion was a bird. By the time he noticed the movement, the fastball was already out of his and it was too late. This incident actually wasn’t being viewed on live television because this particular spring training game wasn’t being aired. However, you can find footage of the incident online because it was caught on film and then aired at a later date. There was some fallback after Johnson hit the bird with the pitch. Although it was an accident, members of PETA (People for the Ethical Treatment of Animals) were outraged and the organization considered filing a lawsuit against Johnson for animal cruelty. Randy hired a lawyer and PETA was never able to gain ground with their accusation. Although Johnson is in the National Baseball Hall of Fame, the incident is one that people still remember about him. He also chose the image of a bird as his watermark for his professional photography, which does show that the incident made an impression on him, as well. Randy Johnson, also known as “ Big Unit ,” was born in 1963 and played 22 seasons in Major League Baseball before retiring in 2009. 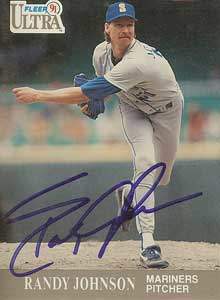 He played mostly for the Seattle Mariners and the Arizona Diamondbacks, but also a number of other teams. He has the second-most strikeouts in Major League Baseball ( Top 1,000 ), which tells you just how fast his pitches could be. His height (6’10”) gave him an advantage not only in baseball, but he also had an opportunity to play basketball, which he turned down having enjoyed baseball much more. Randy Johnson would be named to All-Star Games 10 times and won one World Series (2001). Although his statistics and accomplishments have landed him in the National Baseball Hall of Fame, the incident where he hit a bird is still talked about to this day.